State-of-the-art home cinema design, intelligent home automation solutions for modern homeowners designed, installed, and maintained by Pro Install AV. Back home, it’s just as dark, cold, and miserable as you thought it would be; hardly the kind of warm, homely environment you’re looking forward to returning to. So, you flick another button, jump in the car, and return home regardless. On arrival, nothing seems to have changed at first. The display on your tablet tells you it’s chilly inside, the lights are off, and all around looks particularly uninviting. As you get a little closer, your fully automated smart home clocks your car’s registration plate and loads up your own pre-configured program. It turns the lights on, the heating up, and your entertainment system to just the right volume, creating the perfect welcome-home environment before you even step through the door. Now, stop picturing it, and start speaking to Pro Install AV. Why? Because what we’ve just described above doesn’t have to be some far-off fantasy. With our intelligent home automation solutions, you can start making your dream home a reality today. From automatically loading up the perfect playlist for that high-energy workout in your home gym, to turning on your favourite TV channels and setting just the right mood lighting for a relaxing evening with a loved one, it’s all possible thanks to Pro Install AV’s fully certified, highly experienced electricians and engineers. 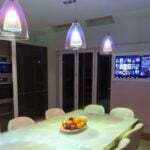 Start making your dream smart home a reality by calling us today on +44(0)20 7096 0078 to arrange a free consultation on lighting, audio visual, and home cinema design services.